York City Knights coach Dave Woods was once again a frustrated man after watching his side lose to Widnes. The Knights lost the match at the Huntington Stadium 22-18, but picked up a losing bonus point to move off the bottom of the Championship. 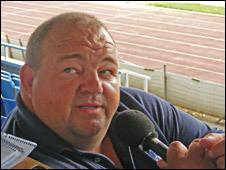 Woods told BBC Radio York: "It was a decent effort from our blokes, but again our errors have cost us. "They scored on the back of those errors. We'll keep plugging away and hope to come up with a win." The defeat was the Knights' sixth in a row and means they've only won twice this season. But Woods believes there were positives to take from the match against the Super League-bound side. "The forward pack did really well. They've copped a bit of criticism the blokes in the front row, but they all stood up today and worked really hard for each other," he added. "That's what we've been doing, we've been trying to work hard for each other and get the results. They're working hard in training and in the games. "We've gone three weeks now against three of the better teams. In each one of them we've put ourselves in a position to win the game." The Knights now have a fortnight off before a crunch match away at Hunslet who sit just above them in the table. Woods said: "It's a must-win. We get next week off and we'll just work hard during the week, give them a little time away. "We've got to go there, it's a tough place to go and we've got to make sure we get the three points and then hopefully kick on. "We've got Batley at home and then Toulouse at home, that's a must-win as well. "We need to just keep working, keep doing all the things right and just cut out these little errors that we're making and we can get the points."